Coming back from the waterfall, walking down the Monkey trail we heard a big noise and the tree branches breaking. We stopped completely and stood quiet paying attention to the forest to realize that it was the jungle mafia, yes the White Face Capuchin Monkeys giving us a warning: â€œHEY YOU GUYS! This is our territoryâ€. Mike and Lisa were captivated by the scout of the group and the troop behavior. These are the smartest monkeys in the Tropical Rainforest, they are opportunists (they eat everything) and they can live up to 45 years. 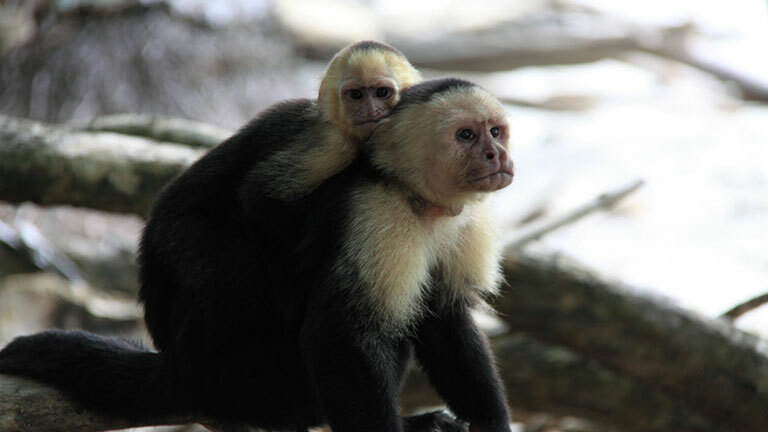 Capuchin Monkeys travel in packs from 6 to 8 males and as Mark and Lisa witness it, they fight to protect their territory.